Radhika Menon will become the first woman in the world to receive the Award for Exceptional Bravery at Sea from the International Maritime Organisation for saving the lives of seven fishermen, whose hopes of survival were all but over. Menon was at the helm of oil tanker 'Sampurna Swarajya' of Shipping Corporation of India. 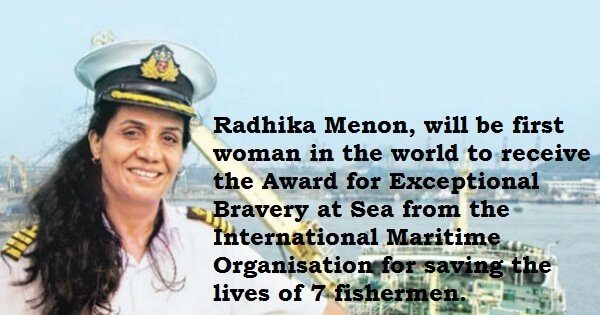 She is the first woman captain of the Indian Merchant Navy.. and will be the first female to receive the Award for Exceptional Bravery at Sea.